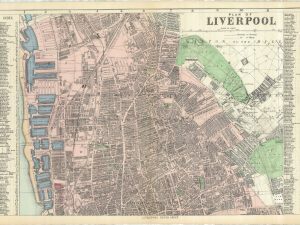 This is perhaps the most beautiful, certainly the most artistic old map print of Liverpool on this site. It’s uniquely a bird’s eye view (as opposed to a top-down view) of Liverpool, as it might be seen from a balloon hovering somewhere over the Wirral. So in the middle of our view are the docks – George’s, Prince’s and Albert – with the Goree Piazza just behind. Two more of Liverpool’s landmark buildings – now both sadly lost – are here: the Custom House and the Sailor’s Home. Finally, there are the lesser known edifices: the Borough Gaol in Kirkdale and George’s Public Baths on George’s Parade. Did you know there was a swimming pool where the Pier Head is now? But it’s not just the buildings on this print; it’s not just the Liverpool landmarks. It’s the sheer detail that the engraver has put on this print. You can see the dozens of ships ranked row upon row in the docks. 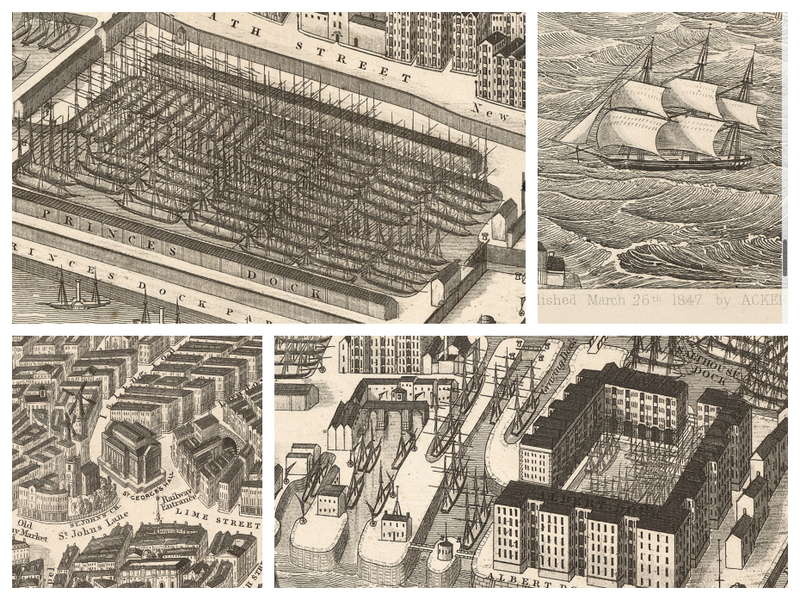 Is this artistic license, or did sailors and dockers really have to deal with this gridlock? 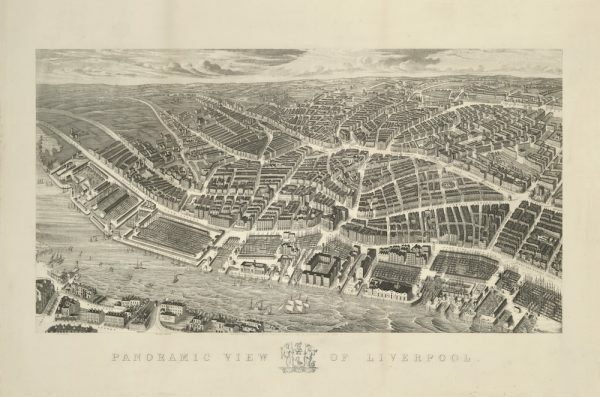 Either way, it captures the spirit of the banks of the River Mersey in 1847. 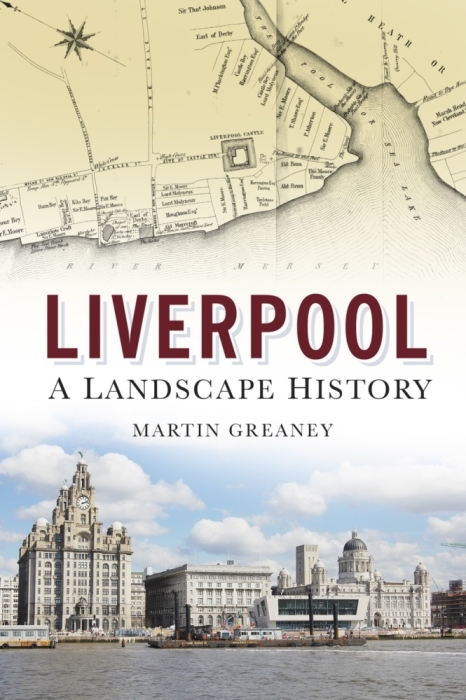 Also look out for railway lines snaking through the landscape; windmills dotted right across the town; gardens and squares captured in astonishing detail, and the rural hills of Everton and West Werby. 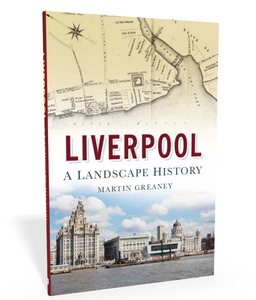 This is the closest you’ll get to seeing Liverpool as its inhabitants saw it at the time. 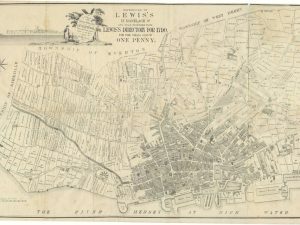 It gives much more of a sense of the bustling town than a standard map, and looks great framed. 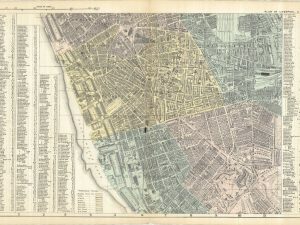 This item, and other maps of Liverpool just like it, are available to preview as high resolution interactive maps on the website Historic Liverpool. Note that the images on this page don’t give a great impression of just how good this map is, because the imagery has been compressed. This is a high definition print of a large digital file. If you want maximum detail, you can’t beat the full sized print, but the smaller print still look wonderful. 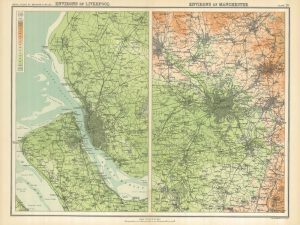 Whether as a gift for a loved one, or to treat yourself to something for hanging in the study, this map is a fascinating piece of history you’ll want to study again and again!